An unusual sight at Fresno City Hall in Downtown where someone left a mattress, complete with a fake councilmember, laying in a parking stall. 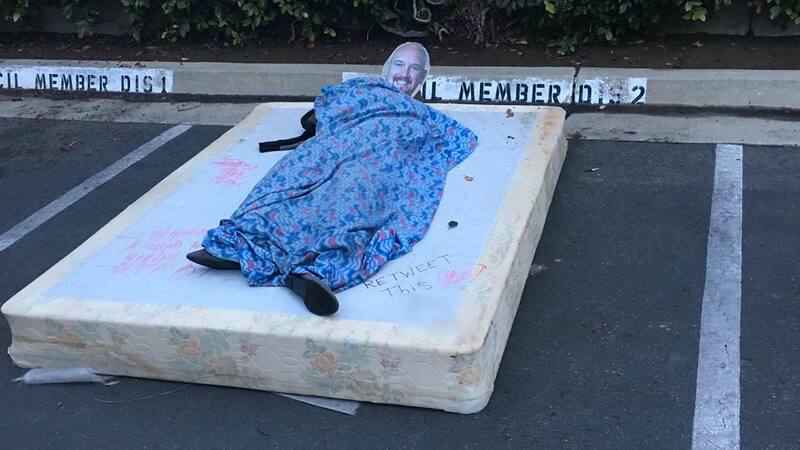 FRESNO, Calif. (KFSN) -- An unusual sight at Fresno City Hall in Downtown where someone left a mattress, complete with a fake councilmember, laying in a parking stall. The councilmember featured in this was District 2 Councilman Steve Brandau. Written on the mattress was "Retweet this" with an obscene gesture drawn below it. Councilman Brandau tweeted out a photo saying, "We have great artists in Fresno! Here is a depiction of a homeless me!" No word on who may have left the fake councilman or why.